Children, children, please! Stop your bickering and sit down in a circle. China, have a seat, you too Brazil. Japan, you get a Time Out. That kind of aggressive currency behavior simply will not be tolerated – you lose arts and crafts privileges for one week. Origami swans count, put that paper down! The simple fact is that although you’d all like to be export-driven economies, this is a logical impossibility. If everyone in the G20 is to be a net exporter, then we’ll either have to convince Mongolia to start buying a lot of stuff or find alien life elsewhere in the galaxy to market and sell to. Ah! Now you’re quiet! Very good children. Dropping your currency will be punished the same way as dropping your pants in this classroom – it is strictly forbidden. And picking on Brazil will also not be put up with. Brazil is a growing boy and needs to be able to export, too. Stop snickering, Timmy, I saw right through your ‘Strong Dollar’ speech the other day. 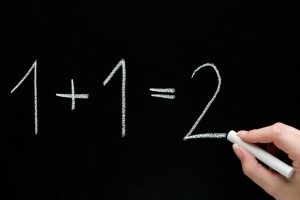 And China, your cosmetic rate hikes are just as phony, none of us are fooled. Here’s the deal, children…If we can go the rest of the day without any more jawboning, saber-rattling or currency manipulation I will reinstate milk-and-cookies time this afternoon. *Redacted* "favors emerging stock markets, Brazil and Turkey in particular, over developed markets, but he is bearish on China, citing what he views as ‘extraordinary economic imbalances and the mismanagement of its economy’." Let me help you out with that notion, homeboy… Liking Brazil while disliking China is like favoring the Indianapolis Colts in the Super Bowl but betting that Peyton Manning will have a bad game. I’m hearing this "Brazil is great but watch out for China" thing a lot lately. It just doesn’t work that way. China and Brazil are quite possibly the most symbiotic investment story going right now. It’s completely understandable if you don’t like what’s happening in China, including the crane-filled skylines, the widening gap between those who can and cannot afford city real estate, the ghost cities and the infrastructure being built just for the sake of building. But if you are a disbeliever in the Chinese boom or its ability to continue, how could you possibly want to invest in an economy like Brazil that is completely beholden to China’s appetite for building materials, finished goods and food? Brazil’s burgeoning middle class and the rise of their own internal consumer culture are highly appealing to investors, especially when you look at the progress they’ve made in beating back inflation. But don’t for a minute think that the Brazilian consumer isn’t flourishing as a result of the world’s insatiable appetite for the country’s mineral and agricultural wealth. Companies like Vale ($VALE) and Petrobras ($PBR) have been coining money by selling to the Chinese Dragon and that same money is precisely what has trickled into the Brazilian population’s purse. China displaced the US as Brazil’s number one trading partner in 2008; the annual trade balance between the two nations has grown exponentially over the last decade and is now in the range of $36 billion. In May of 2009, they also signed a $10 billion oil agreement. "We could have bought and could have had great profit, in addition to prestige," he said. 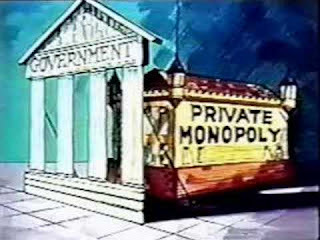 The minister said the decision not to acquire the bank was made by the government as a whole. Mr. Lobao said that before the U.S. government had bought a third of Citi, the institution sought the Brazilian authorities. 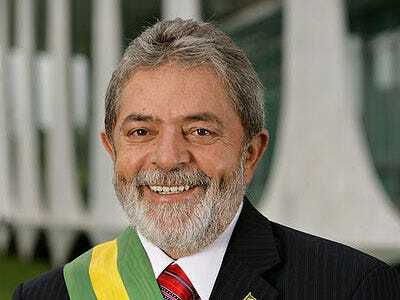 He said he did not know the "fair price" which was discussed with Brazil, but, considering the size of the country’sreserves, the country could have purchased a share of the institution. 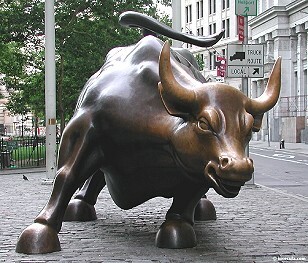 In late July, Citigroup completed the exchange of securities of $60B that made the U.S an owner of a third of the bank. All the $ 20.3B in preferred stock and hybrid securities and equity securities issued publicly by Citi were exchanged in the offer for common shares, while the federal government shifted about $39.5B of preferred stock for new bonds. Emerging markets, it seems, have had a good crisis. In contrast to the debt-ridden G7 economies, they have quickly resumed their growth trajectory. No surprise, then, that US emerging market mutual funds are experiencing record inflows. The stellar performance of the Brics markets – Brazil, Russia, Indian and China – is due to continue into the distant future. While 45% is nothing to ignore, one should take into account that the S&P through July 31 is still down more than 20% on a price basis year-over-year. The bottom line is that we are not inclined to aggressively chase the market here. Rather, we eye a better opportunity to be long equities into year-end on a potential autumnal pullback. The forceful policy response to avert depression tail risks posed by the financial crisis has likely unleashed a wave of liquidity which is probably greater than that of 2001-2003. Our job is to identify the best performing assets of this “Great Liquidity Race.” At present, it appears those assets are gold, emerging market equities denominated in local currencies, and commodity related stocks. Liquidity is making its way into bond purchases by banks, into equity markets, into capital flows to emerging markets and into international reserve accumulation and related diversification away from the dollar. This will be the trend over the next quarter—or two—even before discussing potential portfolio shifts within it. 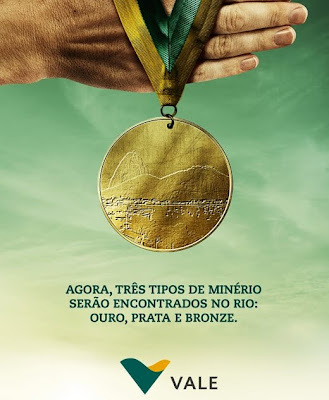 New VALE ad commemorating Rio 2016: "Three types of minerals will be found in Rio: Gold, Silver, and Bronze"
With Rio de Janeiro having just being awarded the Olympics 2016 there will be enormous activity and interest in Brazil. There will be tremendous investments made in the city and in the country. Whether the government itself makes a profit money-wise is a difficult proposition, and difficult to measure. However, the benefits to the country are long term and in many other indirect areas. Many companies and sectors will certainly boom and make considerable revenue. Over the next months and years we will dedicate considerable effort to dissecting these companies and sectors to pinpoint the winners. 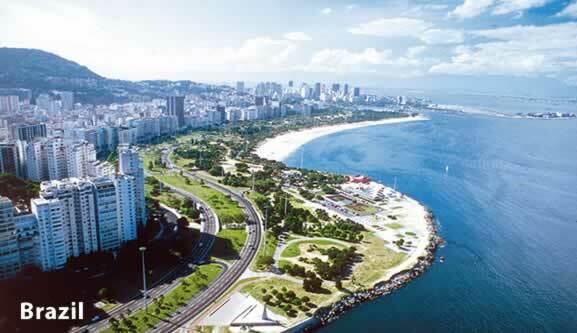 Also, in future posts, we will be talking about other companies, while not directly Brazilian ADRs, but that do most of their business – of profits – in Brazil. I know these companies and the market well, and have very good connections over there. Much more on this later. Also, please see another recent post on Brazil on September 23, with expert interviews on BNN TV. This article shows all the current Brazilian ADRs. These are securities that can be traded in North America, like regular stocks. Most have good volumes, and most of them have options as well. Some of the companies are very large and are among the biggest in the world. For example, ITUB has a market cap of over $90B, much higher than most banks in the world. VALE is at $120B, VIV $10B, ABV, $52B, BBD $61B, and so on.